Sister Najma and Sister Sara greet visitors to the Mother of Mercy Clinic, Zerqa, Jordan. The mystical communion that was at the heart of St. Catherine’s spirituality inspired her to reach out to the poor and suffering of Siena. When the Black Death swept through her city, she had no hesitation in caring for the victims. She worked as a nurse. She dug graves for those who died of the plague and then buried them properly herself. She accompanied prisoners who were condemned to death to the place of execution waiting with them and praying for them to the end. In our own day, the courageous and sacrificial spirit of St. Catherine lives on in the order that bears her name, the Dominican Sisters of St. Catherine of Siena, based in Iraq. Today, they are caring for the displaced, the frightened, the sick, the orphaned — their brothers and sisters who have fled ISIS. As we have reported, these generous sisters are the face of Christ to so many who are suffering — and the sisters themselves, despite fleeing their convent in Qaraqosh last summer, are now reaching out to help others in Iraq. Even in the face of immense public health challenges, the Mother of Mercy Clinic forges ahead with its mission, which is as much spiritual as charitable. “We cannot talk about spirituality in our work,” says Sister Najma. “What we do and how we do it shows our spirituality. St. Catherine must surely be proud. To assist the Dominican Sisters of St. Catherine of Siena and other courageous sisters in their mission, visit this giving page. And — this day in particular — join them in prayers of praise and thanksgiving to St. Catherine, whose life and work has inspired so many good works in CNEWA’s world. 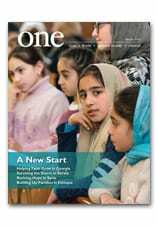 The Spring 2015 edition of ONE is now available online, and headed to a mailbox near you. Among many fine stories, this edition features a powerful profile of Ukrainians displaced by war; a dramatic look at Iraqi refugees being cared for at the Italian Hospital in Amman, Jordan; and a letter from Ethiopia by a sister, a member of the Daughters of Charity, describing her life and her vocation. Once again, this edition brings together first-rate journalism and extraordinary photographs to produce one of the most acclaimed magazines in the Catholic press. We’re proud to be able to share these stories with you — and to bring CNEWA’s world into your world, reporting on the vital work we do and the important role you are playing in helping to bring the love of Christ to so many who are in need. Check out ONE — and be sure to visit our virtual edition to experience this award-winning magazine on your computer exactly as it appears in print.